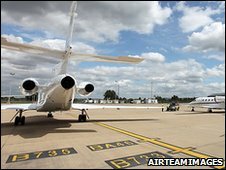 The firm that runs Coventry Airport is the subject of a winding-up petition by the Inland Revenue, the BBC has learnt. A petition to wind up West Midlands Airport Limited was recently put before the High Court. The airport, which lost its only passenger airline in 2008, has to respond to the petition at a hearing in the High Court, due on 9 December. The airport said it was operating normally, but was aware of the petition and was "actively seeking a solution". In a statement, it said it was not willing to make further comment while proceedings were taking place. Coventry City Council, which owns the freehold to the airport, said they were "following the matter with interest and are awaiting the outcome of the High Court hearing in the next few days". The airport lost passenger airline Thomsonfly in 2008 and a year earlier it saw plans for a new terminal rejected after a public inquiry. The inquiry found there would be an adverse impact on noise in the area. Since then, the airport has been operating as a cargo terminal and a base for executive jets and aviation-related businesses.